Hello again, friends. Once again, it has been a while. I have been very up and down over the past several months, and certainly since my last post. Sometimes, I feel very optimistic about the future and really believe that good people doing good things can make good changes in the world. And sometimes, I'm just exhausted and saddened. I have been reading, though not as much as I usually do. And not many books that I feel compelled to review. I have been drawn to non-fiction of late, possibly in the hope that my reading facts will compel the rest of the world to trust in facts. Or to help me make sense of how the world came to be the way it is now (though I do feel strongly that fiction can help just as much as non-fiction in that regard). 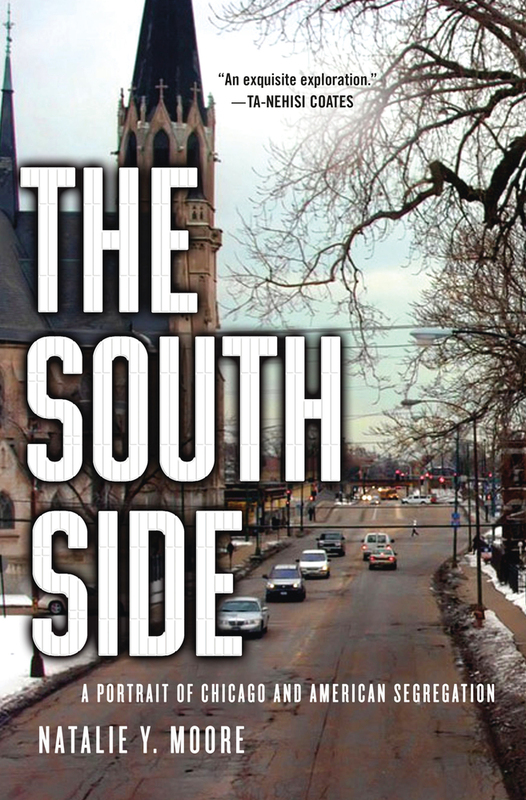 I recently read Natalie Y. Moore's The South Side: A Portrait of Chicago and American Segregation. As I think many of you know, I have lived in or around Chicago my whole life, and I love the city so much. But it is a city with deep-rooted problems. It's a city that can break your heart if you let it, from a legacy of corrupt politicians, gang violence, police brutality, and segregation. Martin Luther King, Jr. said that he had never faced such virulent racism anywhere as he faced in Chicago. The beautiful, striking skyline that locals love so much came at a huge cost to many communities and people. Natalie Moore writes about her own life growing up on Chicago's south side (the historically black area of the city) and then settling back on the south side as an adult. Her book is so many things: an homage to her happy childhood, a guide to so many of the city's overlooked neighborhoods (and restaurants! ), and an indictment of how little the government has done to invest in black neighborhoods. The facts she shares about what it's like to be Black in America are pretty horrifying, not only because it's so obvious that racism is there, but because it just seems so endemic. I know that a lot of racism is under the surface now, even sub-conscious. But its consequences are just as real and impactful, and it's just so sad. The chapter that most affected me was the one on gun violence in Chicago. Some have given the city the nickname "Chiraq" due to how many people have been killed here (one year, more than the number of US soldiers killed in Iraq). As someone who lives in the city, I would say the news of shootings and killings is absolutely constant, particularly in the summer. It's unending. It's horrifying. It's such a tragedy I don't even know how to describe it without sounding trite. And it makes Chicagoans themselves scared of their city. People don't take public transportation after a certain time. We don't walk in parks after dark. We tell people when we reach home safely. And there are some neighborhoods that people just won't go to. Such as many, many neighborhoods on the south side. We won't even stop for gas there, let alone think of shopping or eating there, or definitely not living there. I have, of course, always been aware that violence in Chicago has an indelible impact on communities. Kids who can't play outside, teens who can't go to school, family structures broken down. But I don't think I realized just what a huge economic drain it is, too. If everyone is too scared to visit a neighborhood or to even walk around outside, then business suffers. And if businesses don't feel like they can invest in a neighborhood, then no one is ever going to move to them. And property values decline, and people move out, and the city continues to shrink, to condense in the very gentrified central area. And when you refer to a community as a "war zone," you automatically think about punishment and strong enforcement as the only means of solving the problem. You don't think about how to work with the community for longer-term solutions or addressing the root of the issue because you're so busy scrambling to save lives in the moment, to stop that next gun from being purchased. Its consequences are much more far-reaching than I ever considered, and it makes me even sadder for my city than I was before. I also really enjoyed the chapter about food and access to food. Whole Foods is opening a massive store in Englewood, one of Chicago's poorest (and most dangerous) neighborhoods, and it created quite a stir. Were they trying to gentrify the neighborhood? Were they trying to do good? Would people be able to afford to shop there? Were they going to bring some cheapened version of their store that wasn't as nice as the other Whole Foods in wealthier neighborhoods? It was so fascinating to read multiple points of view on this. The store is slated to open this fall, and I hope it helps the community. Moore talks about many more topics in her book - public housing and public schools, her own childhood, property values, the pros and cons of integration vs access to the same resources, and so much more. Her own love (and frustration) with the city comes through strong and clear. Obviously, people who live in or around Chicago are probably most likely to be interested in this book, but I think much of what is true about Chicago is true around America, or at least the Midwest. And if you are not American, and look at America now and wonder what is happening, I think this book would be a good primer to help you understand. It's really well-written, very evocative of the city's highs and lows, and I am so glad I read it. There's a reason that I came out of my semi-blogging retirement to write about it and urge you all to read it. I hope you do. I hear about the troubles in Chicago all the time. Have you ever thought of leaving? Or do you love it so much you want to stay? It sounds like this book is very complete in the assessment of all the facets that go into this city. Not being a city girl, I wonder why it is worse there than other US cities. Hi Nan, no I don't really ever consider leaving. Most of my friends and all of my immediate family lives here, and I DO love the city. I don't have any desire to leave. I don't know that Chicago is worse than other Steel Belt cities, it's more likely just indicative of a lot that happened all over the country. Detroit and Milwaukee are also very segregated. As for the violence, I am not sure why it is so bad here, though Moore does put things into a different perspective. The last big thing that happened in LA before I stopped living there full time (college) and then moved entirely were the Rodney King riots. And they were truly frightening for the entire region. Seattle is so much tamer though things aren't rosy here either. An African-American woman spoke up on a community forum the other day to point out that her children have experienced worse racism here than they ever did living in the south. That was so depressing to hear. Sometimes we get caught up in the problems of the nation and the world but perhaps if we turned our gaze on our own cities a little more often, we could actually make a difference. At least, I hope it's still possible to break these cycles of violence and poverty and racism! Oh wow, I never knew Chicago was such a violent city (living in Europe..). Sounds pretty terrifying. With the caveat that probably living in America with its excessive gun violence seems terrifying to ALL Europeans, I don't really ever feel scared living in Chicago. But that's the author's point, really, that it's so segregated and access to help/resources is so different. So I can feel quite safe while someone else feels exactly the opposite. I know 100% what you mean. It's easy to love a place and feel so sad about it at the same time. I've been reading loads of depressing non-fiction. Maybe I should switch to something a little more upbeat and light. But it's hard, given the state of the world. I understand what you mean - it's hard to feel hopeful right now. It's been a slow reading summer for me, as well, probably for some of the same reasons. It's good to see you writing again, though - your thoughts about books always make me want to read them. No exception here. Hope you are well.